We've rounded up three artsy events around Chicago this weekend that will scratch your cultural itch, from free community arts activities to a live painting competition. Near North Design Day brings free art activities and a trolley bus tour to the community this Saturday afternoon. Participants can join a clay printmaking workshop inspired by the iconic Old Town designer, painter and woodcarver Edgar Miller. Artist Sharon Bladholm will also lead an art project celebrating the art and design of the neighborhood. Then, hop on the trolley to tour historic venues that have made a significant impact on the neighborhood's art scene, including the Chicago History Museum, Sedgwick Sculpture Studio and Edgar Miller Legacy. When: Saturday, November 10, 12-4 p.m.
Where: Art on Sedgwick, 1408 N. Sedgwick St. 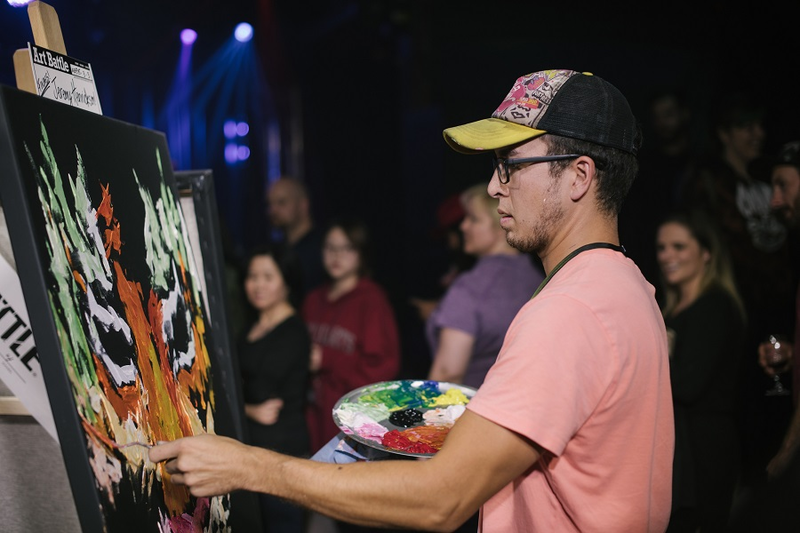 Paint will fly at Lagunitas this Saturday evening during Art Battle's Midwest regional finals. With hopes of snagging a spot at the national championship, contending artists from Elgin and Fortville will go head-to-head in this live painting competition. The audience will vote to determine which artist will represent the Midwest against other creatives from across the country. All of the paintings created in the competition will also be available for purchase in a silent auction. When: Saturday, November 10, 7-11 p.m.
Where: Lagunitas Brewing Company Taproom & Beer Sanctuary, 2607 W. 17th St.
Comedian and entertainer Gwen La Roka, along with a crew of stand-up comics, will take the stage Sunday night at Joe's Bar. La Roka, best known for her stories about growing up in a Latino household and living in Chicago, has most recently appeared on the Emmy-winning show "The N Beat" on ABC7. After the show, stick around for music by Mr. Tony Technics until 2 a.m. When: Sunday, November 11, 7:30 p.m.